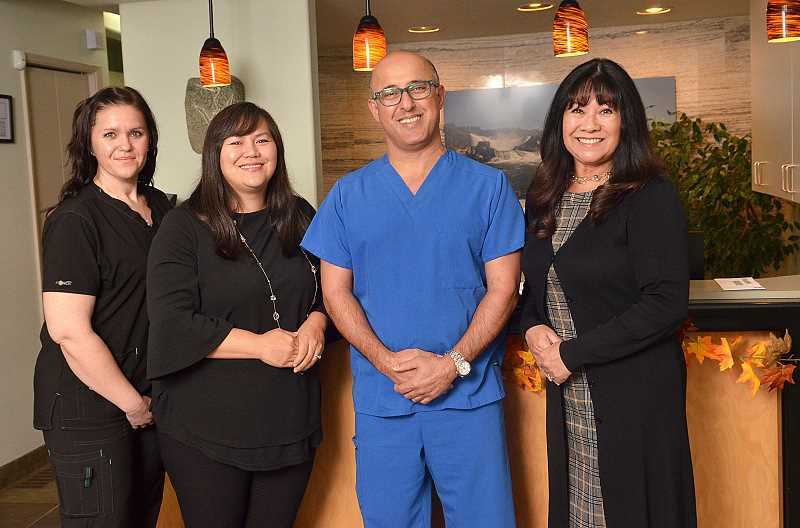 Mazyar Afshar, the owner of a new dentistry near West Linn Central Village, has one simple rule for treating and charging his clients: If he wouldn't advise a procedure for his children, he wouldn't suggest it to a patient either. "My goal isn't how many things I can do to the patient to make the most amount of money out of the patient, which happens more often than not," Afshar said. "For me it's about doing the right thing." West Linn Dental Works recently opened at 1750 McKillican and replaced David A. Renton Family Dentistry. The office is available for appointments Tuesday through Thursday each week and Afshar is hoping to expand to Fridays at some point. Afshar graduated from the Oregon Health and Science University in 2010 and opened practices in North Portland and Beaverton thereafter. Coincidentally, Renton was one of his golfing buddies and Afshar had previously inquired about taking over the property once Renton retired. And in August, that's exactly what happened. "I'm a big fan of an area that is more family-oriented; that there's a big community of people that are having the same common goal," Afshar said. "West Linn was the area that I thought would be a good addition to our family of practice." Afshar said Dental Works offers cosmetic work and cleaning as well as surgeries like root canals and treating gum and bone diseases. He also said he has worked with patients as young as 2 years old and as old as 102 years old and appreciates getting to know them on a personal level. "I like the idea, knowing the family practice just like the olden days, (when) you knew your doctor," he said. Relatedly, he said he doesn't view his dentistry as a business where maximizing profit is his number one goal. "I don't want to attract the people that are there for a deal," he said. "As a health provider, it's not a business for me." While Afshar performs most of the surgeries, his cousin and colleague handles general services. "It's great because I've watched him grow so I know his values. I know who he is and how he treats people," Afshar said. "It makes a world of difference when you are trusting someone with your patients." Afshar said transitioning to West Linn has been more challenging than he expected because Renton had developed such a loyal customer base. But he's excited to get to know West Linn residents in need of dental help and earn their trust. "I'm happy to be a part of the community and be able to serve the West Linn community in addition to the other practices," he said.